Tripp Lite's U236-000-R USB 2.0 Ethernet Adapter allows your computer to instantly connect to a 10/100Mbps network through a USB port - no need to open up your computer case to add an internal Ethernet card. The adapter's compliance with USB 2.0 (480Mbps) ensures true 10/100 Mbps network speed without any compromise. Furthermore, the adapter is compact and is USB bus-powered; requires no external power adapter. 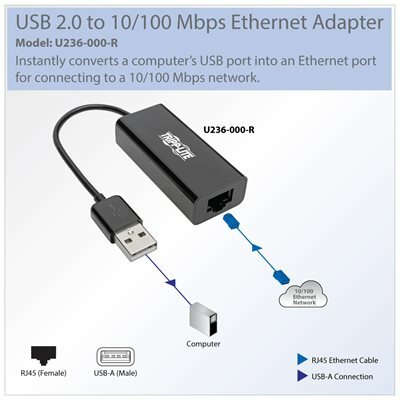 Tripp Lite’s U236-000-R USB to 10/100 Ethernet adapter allows you to connect a device without a NIC (Network Interface Card) to an Ethernet network, an ideal solution when Wi-Fi is weak or unavailable. Keep the compact 7.5 in. U236-000-R adapter in your laptop bag for on-the-go Ethernet connections in trade show booths and when presenting in auditoriums. It’s also ideal for corporate offices, hotels, and other places where Wi-Fi is available but perhaps not fast enough to meet your needs. When your Ethernet port or Ethernet card malfunctions, it can be an easy solution for getting online if your computer has an available USB port. The U236-000-R adapter with USB 2.0 technology connects computers, laptops, tablets or other USB-A devices to a wired 10/100 Mbps Ethernet network without requiring an internal Ethernet card. It works with Windows, Mac and Linux operating systems and is backward compatible with USB 1.1 devices. The U236-000-R adapter requires no software, drivers or external power to operate. Simply plug it into a USB-A port on your computer and it will be ready to receive an Ethernet cable. The adapter is powered via the USB connection; no external power supply is needed. The U236-000-R is manufactured to exacting standards, complying with IEEE 802.3, 802.3u, 802.3ab and 802.3az Energy Efficient Ethernet standards. It supports full duplex with IEEE 802.3x flow control and half duplex with backpressure flow control. For peace of mind, the U236-000-R comes with a 3-year warranty. It’s manufactured in compliance with strict RoHS specifications, reflecting Tripp Lite’s commitment to environmental responsibility. Founded in 1922 in Chicago, Illinois, Tripp Lite is a leading manufacturer of products to power, protect, manage, house, cool, connect and mount your equipment. With a large selection of connectivity products, Tripp Lite has everything from USB hubs and reversible USB cables to fiber-optic cables and over Cat5e/Cat6 signal extenders. Whether you need to connect high-speed networks to switches, routers and servers in your data center, or send high-resolution video signals to displays and digital signs, Tripp Lite has the complete solution. Plus, before and after your purchase, our Chicago-based, in-house technical support specialists are available to assist you by phone, email and live chat. With over 95 years of quality products and service, Tripp Lite is a brand you can trust.